Thank you very much neiio. Thank you very much, Neiio! Do you think there is a chance, to get the other 2 book-formats too: *.hcs & *.hbg? Schachmatt wrote: Thank you very much, Neiio! I have not been able to find the other two formats despite searching for them. I'll have links available for when I eventually attain the download links. Many thanks for your effort and help! Schachmatt wrote: Many thanks for your effort and help! It's not a problem since I own an iDevice and would be delighted to have Hiarcs14j in .hbg format; and of course I will happily distribute the links here and every other forum I frequent. cheers! Incredible share! love you! do you mind if I distribute these links on other forums? Thank you very much, nanin!!! Normally you get the same version within the App, but now it is another one compared to the file name... However, the amount of openings is correct! Is this the original version by Hiarcs or is this a cracked or even transformed one by the standard file "Hiarcs14jBook.hcs" out of the "Hiarcs Chess Explorer"? Schachmatt wrote: Thank you very much, nanin!!! That's odd.. mine doesn't show the book variety and number of positions. I'm using Hiarcs chess of iPad v13.6. I had to go to the "Engine Room" option and not "Info & updates" What version of Hiarcs are you on? I've cracked the app and submitted the newest version to Appaddict btw. > Hiarcs > Info and Updates > Do you also have this v12006... instead of 13.197? > Hiarcs > Engine Room > Book Variety (at the bottom is the same amount as on the Homepage of Hiarcs) So, this is OK! In general it works, but I would like to know, why there isn't the corresponding No. 13.197 as the file name, because I don't think that Hiarcs changed their system from 13.177 onwards... A transformed version by someone, who is able to do so, would be my guess?! HIARCS14J book is 2-3 months old Book. What's all the excitement about ? 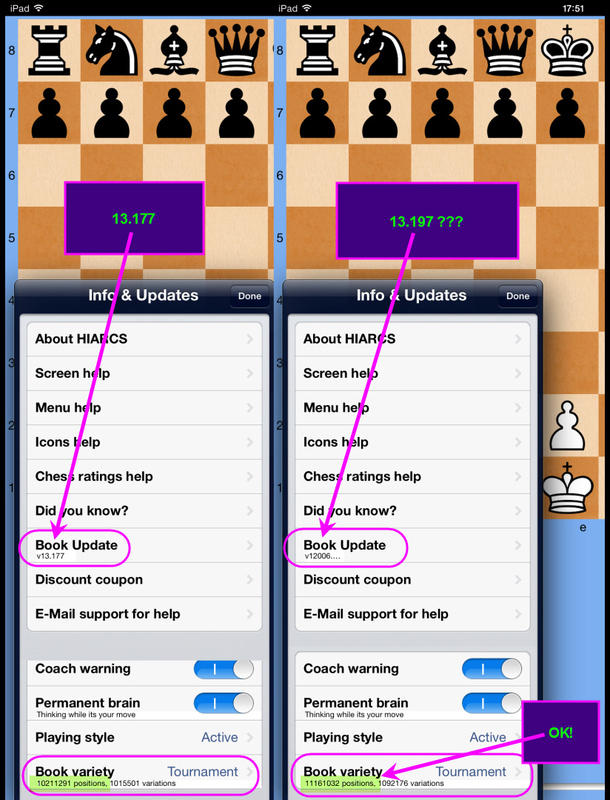 As far as the PC is concerned you are right, but this is the first time, that you get an updated Book for the iPhone and iPad chess app Hiarcs, which is in my eyes one of the best and extensive chess programs in general, together with - a little distance - Shredder, ChessPro and the new Stockfish. However, no other app has an opening book equal to the PC-Version, but Hiarcs has - That's it! shrapnel wrote: HIARCS14J book is 2-3 months old Book. Which book do you(shrapnel and/or Schachmatt) recommend for PC well to be more exact Chessbase interfaces? because I don't know how to determine that so I go with the most popular. As for the best book for IOS then Hiarcs definitely is the book that reins supreme. I don't think, that shrapnel's post was meant disrespectfully "2-3 month old". Above all that you, neiio, was the first, who posted the 14j book for the pc on the 2nd of july. I mainly use Hiarcs with Fritz/ChessBase, as it is official and trustful. If you wanna make your own book, to train certain aspects, you may take MegaDatabase, PowerBook, StrongBook and so on - there are hundreds of possibilities to mess around with - so, I am just happy with Hiarcs' Opening Book both with Fritz and Apple in general. Schachmatt wrote: I don't think, that shrapnel's post was meant disrespectfully "2-3 month old". Above all that you, neiio, was the first, who posted the 14j book for the pc on the 2nd of july. HIARCS14J book is 3 months old Book.